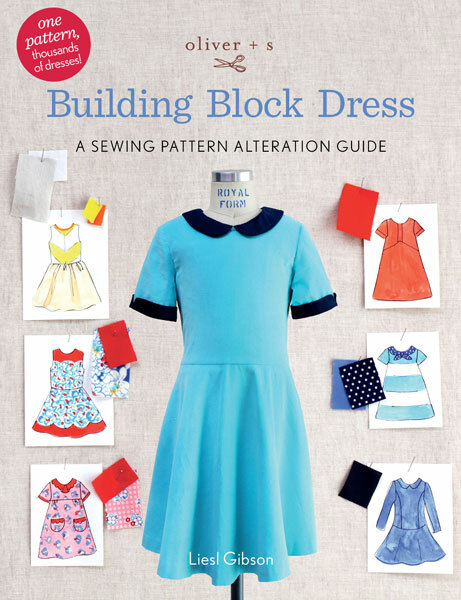 When the new book from Oliver+S, Building Block Dress: A Sewing Pattern Alteration Guide, arrived on my doorstep, my girls and I knew it was time to get to work. This book is very different from any of the other sewing books on my shelf. 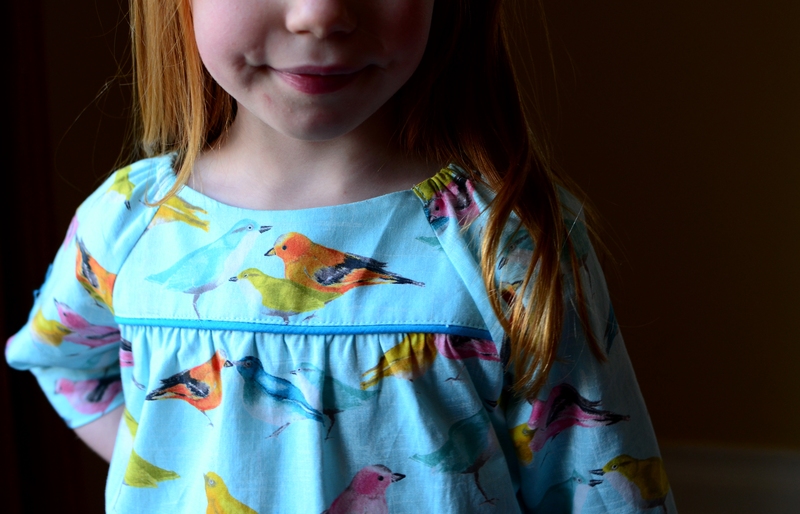 Liesl gives you a basic dress pattern and shows you dozens of ways to hack it into just about any dress you can think of. The coolest thing about this book, I think, is that Liesl gives you lots of ideas for how to tweak the pattern into her own designs listed in the book, but she also gives you the tools to combine just about any silhouette, sleeve, collar, pocket and closure to create you own original design. What a kick! My girls and I had a ball looking through the table of contents with all the photos of different design elements, and then choosing all the parts that would come together in their very own dresses! Just to be sure they knew what they were getting, we did some preliminary drawings. Choosing fabric with my girls is always a challenge. If we look online or take a trip to Joann’s together, they almost always end up falling in love with the latest Disney princess or Shopkin quilting cotton (ick) — and there are only so many character themed garments that I’m willing to make. Know what I mean? So my new tactic is to browse online solo, pick out several fabrics that I think we all will like, copy and paste the images into Powerpoint, and present it to the girls. This way, they can still choose the fabric they like best without being overwhelmed by millions of choices, and I know that I’ll enjoy sewing with it. This time, Michael Miller’s Norwegian Too Hedgehoglets was the hands down winner. In order to pick the perfect shade for the accent color, I emailed the good people at Hawthorne Threads and asked what they thought would work best — since it’s impossible to see exact shades online. They were incredibly quick to respond and had lots of great suggestions. At first, I asked for chambray ideas, and they sent over several good brown options. But then, I reconsidered and decided to go with the red in the mushrooms. Again, they promptly sent over several choices, and I ended up with Cotton Couture in Cherry. Thanks, guys! 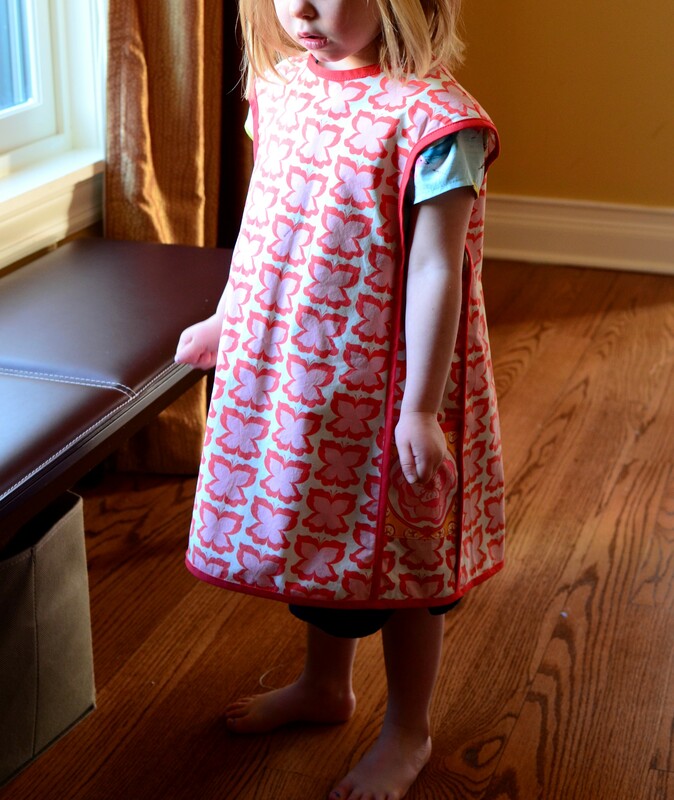 For Kiki — The A-line dress pattern was pretty easy and quick to alter, and the sewing went quite smoothly. This was my first time using the “Slash & Spread” method — which is a way of lengthening a bodice into an A-line dress with even fullness all around. I’m sure this trick will be useful lots in the future, including making dresses out of t-shirt patterns. I’d never finished a collar with bias facing, and I just love it. Such a clean finish! Aren’t the notches in the sleeve cuffs such a great detail?! The only hitch I ran into was with the sleeve cuff facings, which finish the raw edges where the sleeve and cuff are sewn together much like bias tape would. 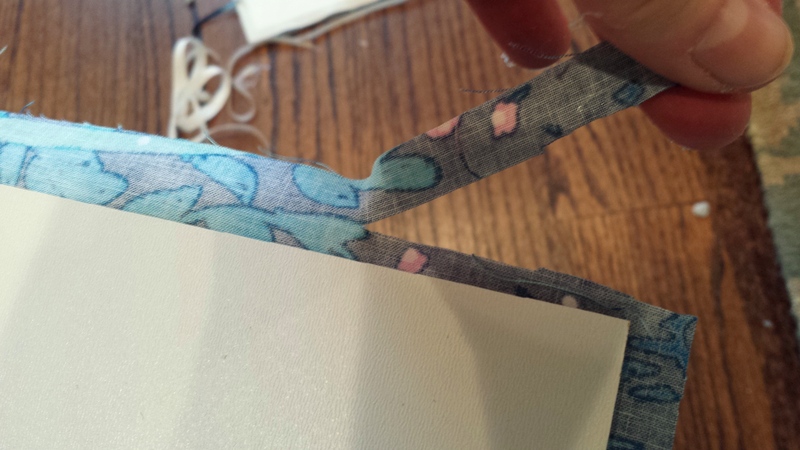 When I tried to sew them on, I found the strips to be too narrow at 1″ wide. So I re-cut those facings to be 1 1/2″ wide, and that fixed the problem. When it was time to add interfacing to the tie collar, I only interfaced the actual collar portions and left the tie part un-interfaced (is that a word?). Next time, I might try interfacing the whole thing, as the tie might lay more smoothly with a bit more body. 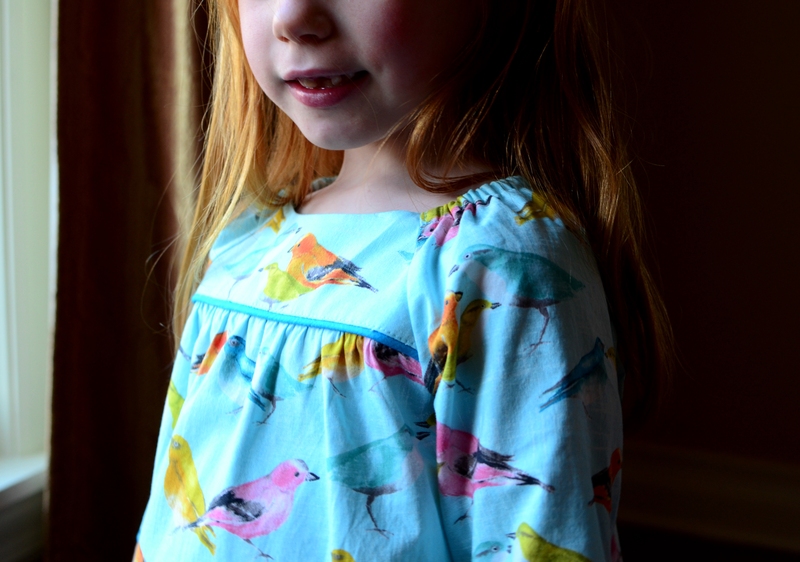 For Lulu’s dress, the pattern alterations took considerably more time and brain power. The scallops on the shaped yoke were pretty tricky to pull off. I didn’t realize until I sat down in at the sewing machine to put the bodice together that sewing a curve like this is a lot like squeezing a square peg into a round hole. But drawing in the stitching lines and stay stitching really helped, and I think it turned out well enough in the end. I also ended up lining the bodice, as the contrast fabric for the yoke is lighter weight than the main fabric, and I felt like it needed more stability. Measuring out the width of the scallops on the hem facing so that I didn’t end up with a wonky scallop on the side seams was another fairly major task. 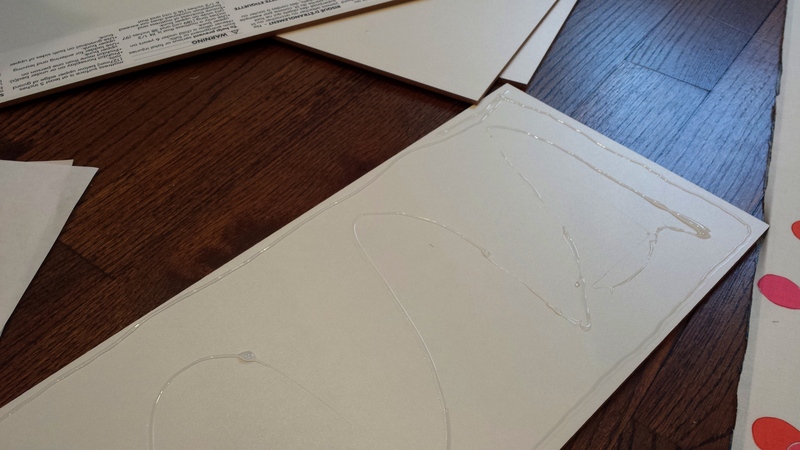 Liesl suggests cutting the scallop shape out of card stock and figuring out the measurements that way, which worked really well. (I used a ramekin from the kitchen to trace the round shape of the scallop.) Once I got the scallop templates sitting evenly, I traced them onto my pattern piece and went from there. My kids’ washable Crayola markers were a life saver when it came time to trace the scallops onto the fabric! Liesl suggests adding interfacing to the hem facing, which worked wonders keeping the scallops smooth and even, while adding a little bit of weight. If I use this type of hem again, I think I’ll try sewing it up in the manner of the O+S Ice Cream Dress, with the accent color is on the outside and the inside of the hem. I think it would look cleaner. I’ve sewn in lots of invisible zippers, and have never been entirely happy with how other patterns deal with the tops of the zippers. Liesl suggests marking 7/8″ from the top of the neckline and lining the zipper stop up with that mark, and then folding the end of the zipper over on itself a little bit and sewing it out of the way. This method worked really well, and I’m sure I’ll use it over and over again. 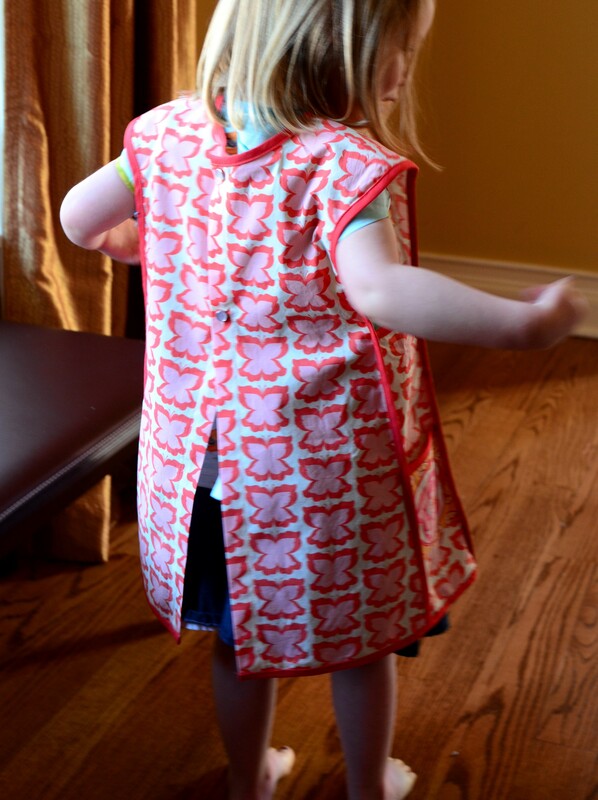 By the way, for Lulu’s dress I only sewed the zipper into the bodice and cut it off where the bodice meets the skirt. I find this method to be way simpler than extending the zipper into the skirt, and there’s still plenty of room to get the dress on and off. Both girls decided on 3/4 length sleeves. Since that length isn’t included in the book, I took the sleeve length measurement from my copy of the O+S Library Dress and cut a bit of length off the Building Block long sleeve. 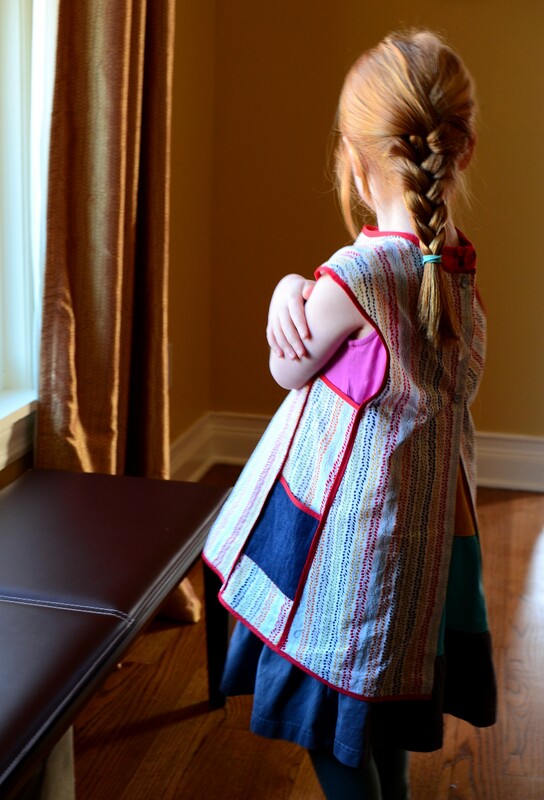 Here’s my take-away from this experience — Designing your own dress based on Liesl’s Building Block pattern does take a much bigger time investment than simply pulling your favorite pattern off the shelf and sewing it up as instructed. But, it’s a ton of fun and can be a great project to tackle together with the dress’s wearer to create the dress of her (and your) dreams! 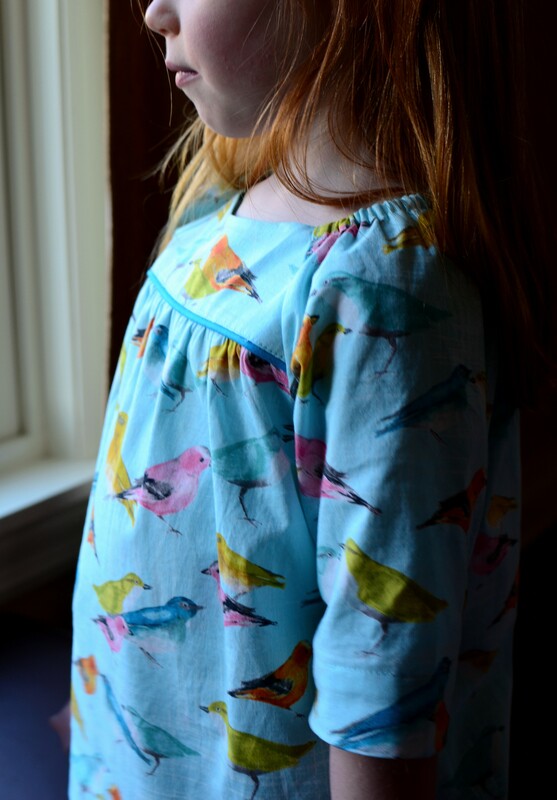 Along with so many others out there in Blog Land, I too have succumbed to the allure of the Hummingbird Dress by Rabbit Rabbit Creations. I mean, what do my girls need more that another summer dress??? Haha. But . . . with a perfect pattern like this, how could I resist? After reading in a blog post about sewing little girl dresses out of vintage sheets, whenever I have a little extra time before picking the girls up from school, I’ll stop by the local thrift shore and check out what’s on the racks. I’ve been amazed by what I find in there for about $3 a pop. If you really look, you can find the cutest prints on the softest stuff that’s been washed jillions of times. And one sheet is enough to make at least two dresses. These particular sheets had been sitting in my stash for a while, waiting for the right dress to come along. I can’t get over these strawberries — don’t they take you right back to 1976? One advantage to a print like this, aside of ultimate cuteness, is it’s ability to hide ketchup stains. Bet you can’t find ’em! Both of the sheets I used probably have a little bit of polyester in there, which gives them this gorgeous, flowy drape. This pattern offers three different skirt fullness options. For Lulu (in the strawberries), I opted for ultimate fullness. Kiki prefers less drama, so for her I opted for medium fullness. I couldn’t believe that I happened to have a piece of broadcloth the perfect compliment color for Kiki’s straps, as well as the same color as her hair. Sometimes, dresses are just meant to be. I came into a bit of trouble when it was time to attach the skirt to the bodice. The method given in the instructions seemed pretty much impossible to achieve. So, I googled to see if anyone else had run into the same problem. Wouldn’t you know, I was not alone. There’s an amazing tute on Glitter + Wit that will show you how to easily achieve a lovely enclosed seam!!! 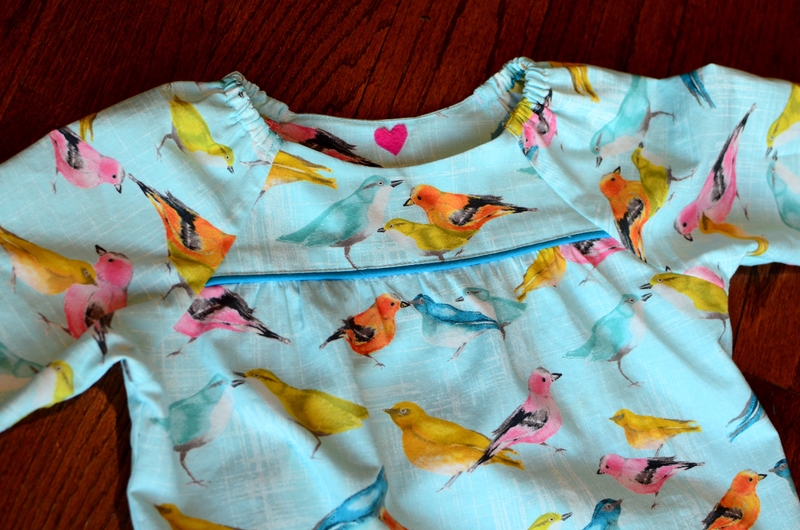 But, do yourself a favor and read through this tutorial before you sew, so that you don’t have to grab your seam ripper and backtrack like I did — because in this alternate method, you need to attach the skirt before inserting the elastic. Thanks, Tasha! Erin from Hungie Gungie also mentions that 1/2″ needs to be added to the height of the bodice piece (and lining), as it doesn’t quite match up with the front bodice. Quite right! When I sew this dress up again, I’ll follow Rachel’s advice and will raise the neckline up a bit and will add 2 inches to the back bodice, as it sits a little bit tight. I wonder if she also added 2 inches to the elastic as well — probably so? Also, be sure to choose your size according to chest measurement. For the six year old Kiki’s bodice, I cut a size 4 width and size 6 length. Lulu (4) got a straight up size 4. On a sticky summer afternoon with the cicadas singing, when the fish are jumping and the cotton is high, you can’t do better than fall for the allure of the Hummingbird! 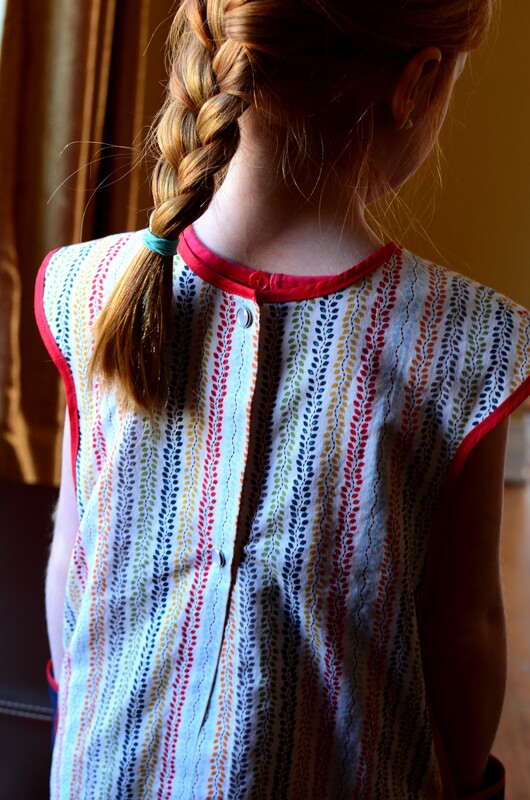 Made By Rae’s Geranium Dress is what really got me started compulsively sewing for my girls about four years ago. The first time I poked around the internet looking for patterns, I came across this beautiful version from Gail. I was completely smitten by the silhouette of the dress and her sophisticated choice of fabric. 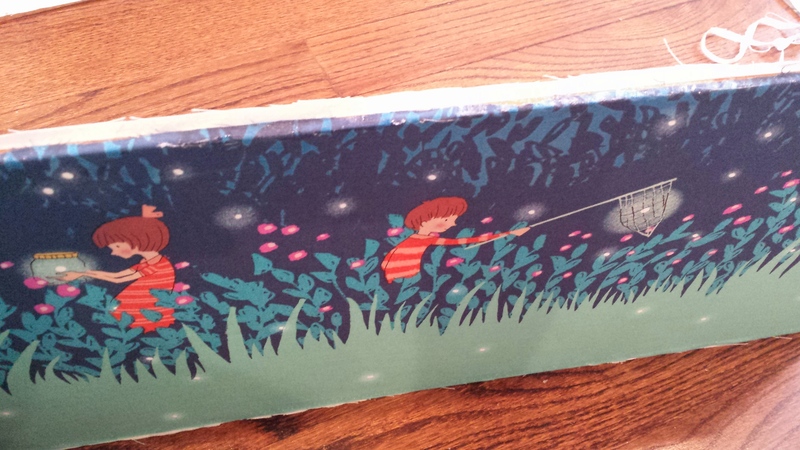 It was as if the clouds parted and I saw all the possibilities out there for kid sewing. Since then, I’ve made at least a dozen Geraniums for my own kids and their friends. 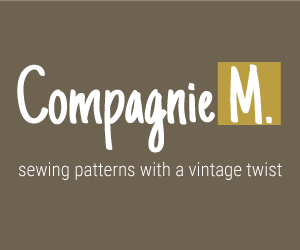 Every time I think I’ve exhausted all the options in this pattern, I think of something else to try. Well, it just happened again . 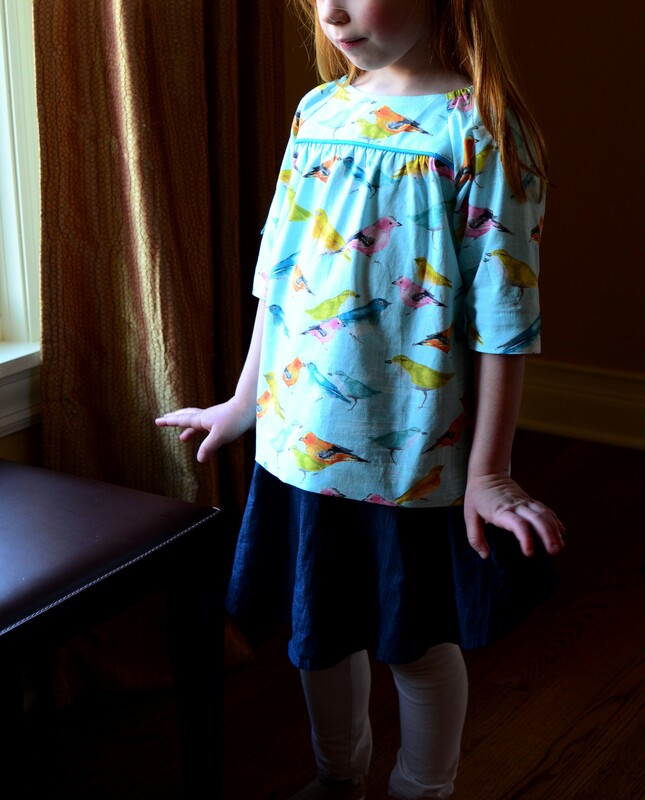 . .
On the occasion of Kiki’s sixth birthday, I decided that she needed a dress that is as grownup as she is. I took a look around and found this very awesome version of the Matinee Dress from the Crazy Tailor. In its original form, I think that the Matinee Dress is a bit too low in the back for my taste, but the Crazy Tailor did such a nice job of raising the back up just enough – and that bow! How awesome! I thought for a moment about buying the Matinee pattern and hacking it in the same way. But then it occurred to me that I could do the same thing with, wait for it, the Geranium. While dreaming this up, I also remembered this Geranium from Girl Like the Sea, which has a similar shaped back. I didn’t need to be convinced any further. It was easy as pie to scoop out the back of the bodice and tuck in some ribbon before sewing the bodice and lining together. Kiki’s choice of fabric (chosen from a selection carefully curated by your truly, ahem) was from Michael Miller’s Brambleberry Ridge line – Flight on top and Shimmer Reflection on the bottom. I was very impressed that she bypassed the pink and chose the mint colorway. I think she’s growing up, guys. In case you can’t see it clearly in the photos, the gold birds and dots are all metallic and shimmery. Very fancy! The flower crown is all Kiki’s doing. This flower crown kit was one of her favorite Christmas gifts this year, and she’s had so much fun making and wearing her own crowns. She decided that her handiwork would be the perfect accessory here. Too true! Now that the Geranium is available up to size 12, I’m definitely going to keep it handy. Who knows what will come out of it next? . 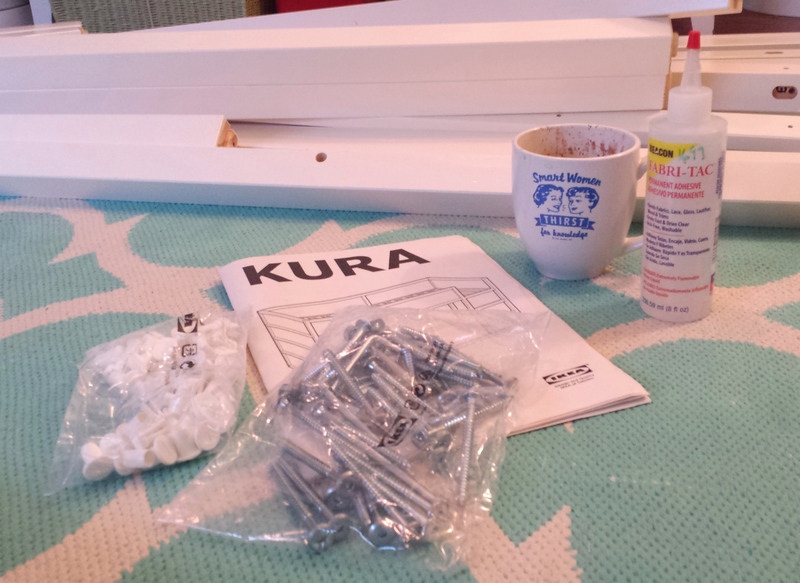 . .
A few months after Kiki’s custom hacked Ikea Kura Bed was done, the complaints began — despite her delight in the beginning. She didn’t like climbing the ladder. She didn’t like sleeping on the bottom. Yada yada yada. You can imagine my dismay. How could this be??? Um, no, you cannot have another bed. Don’t even think about it. Not after everything I went through to create the thing — and let’s not even talk about the expense after buying the bed, the fabric, the ill fated Drummel tool and all those emergency distress calls to the handyman. Here’s a little reminder of what we’re talking about . . . This is the problem with being a mom who creates things on demand. Expectations can get a bit out of control. Then it occurred to me — the Kura Bed is meant to be reversible. Maybe I could flip it, and that would solve Kiki’s issues. 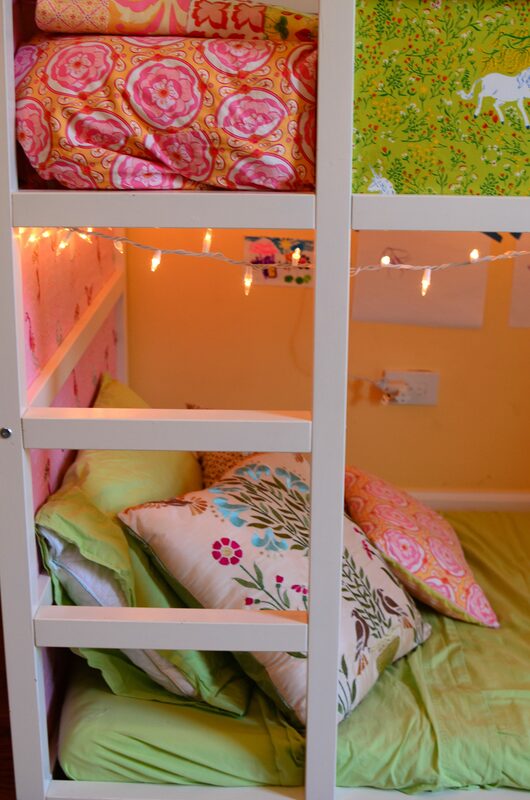 By flipping the bed, I mean changing it from this . . .
. . . to this . . . I discussed this plan with the customer, and she agreed that flipping the bed would be an acceptable (and free) alternative. Of course, one cannot just turn the bed upside down and call it a day — especially if panels are covered with directional fabric, ahem. It became clear that the frame would have to be taken apart completely and that the panels would need to be flipped and reconfigured. And it would have to be reassembled in such a way as to put the ladder on the side of the bed that sits against the wall. This would take some brain power to figure out. And there would be more elbow grease involved. In truth, it took some time for me to accept this cruel fact. After a brief mourning period, I wiped away the tears and stated to take the bed apart. It was too painful a process to document with photography, so you’ll just have to use your imagination to picture the grisly scene. And the cursing. There was so much cursing that I had to send all children out of earshot until the project was complete . . . again. In the end, I came up with this . . .
Don’t tell Kiki, but I really do like this version better than the original. 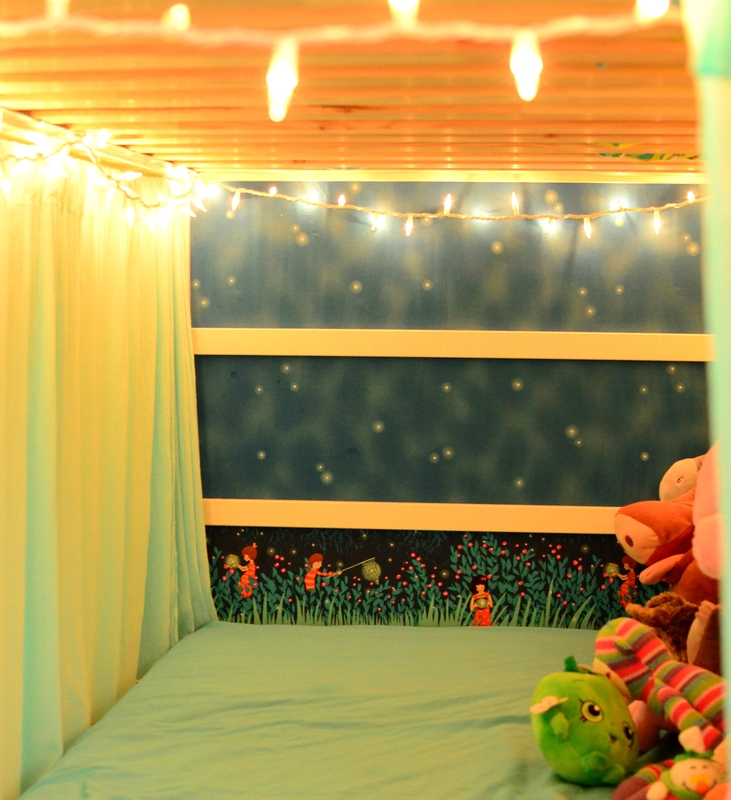 At night, when we turn on the twinkle lights for bedtime stories, it really is magical. I love the mermaids hanging out on the bottom of the bed. You might miss them if you aren’t paying attention. Word to the wise — if you go this route with the Kura bed, be very careful to remember to bend your head down when getting into it, especially when running and jumping exuberantly. Knocking your head on the top of the frame can be brutal. Really brutal. So far, this has only happened once. Guess what. Kiki’s now asking for curtains like the ones I put on Lulu’s bed. About a year and a half ago, it was time to find a big girl bed for Lulu. We’d long ago taken the side of the crib off so that she could sleep toddler bed style, but she kept falling out (poor girl). After a big bruise on the noggin, we knew it was high time for a different sleeping arrangement. So I hopped onto Pinterest to see what’s out there, and I came across this loverly pin from Gail. A few more minutes of clicking led me to this pin, and I was definitely hooked. 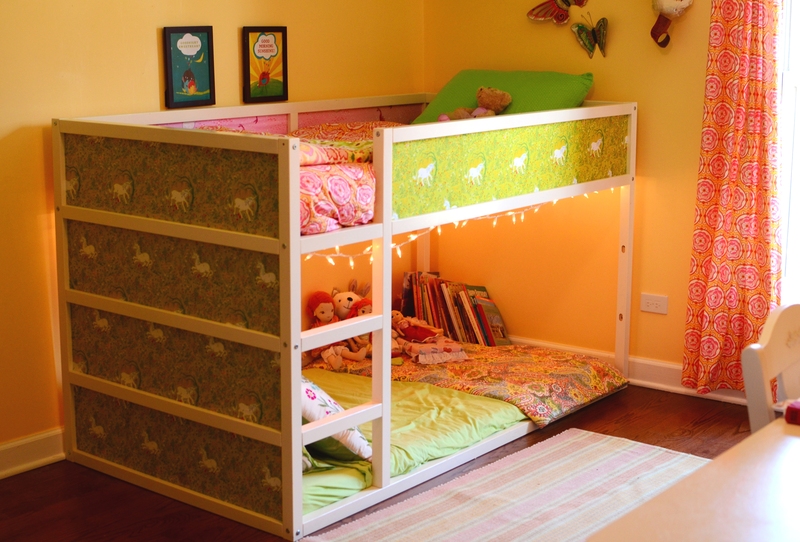 The Ikea Kura Bunk Bed. It’s such a great idea. The draw for me was a combination of cuteness, creative possibility and an opportunity for Lulu to sleep in a bed that is essentially a mattress on the floor with no possibility of falling out. 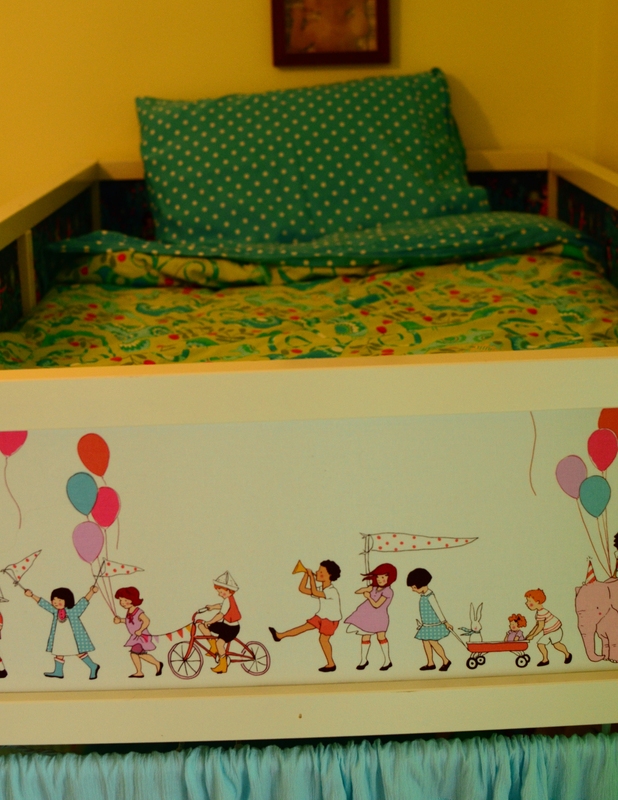 The other plus is that Lulu’s room is smaller than Kiki’s, and a bed like this gives more playing space in a small room. 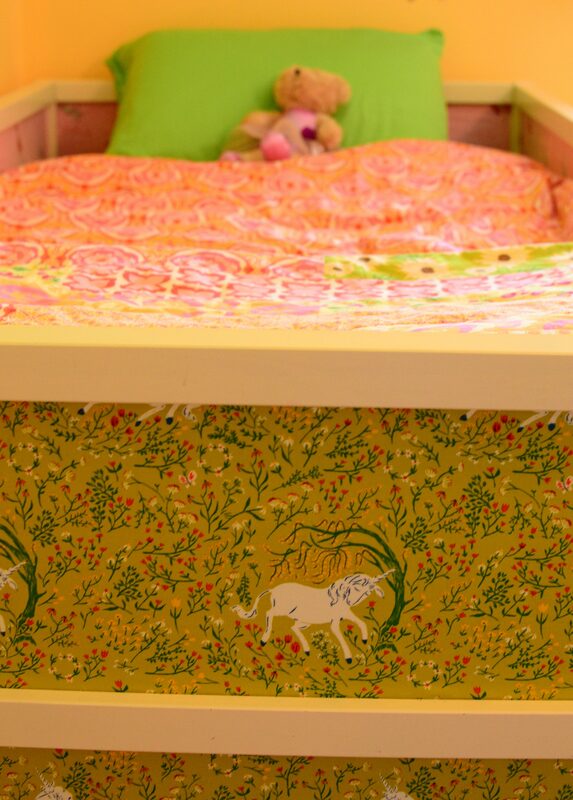 If you want to be amazed, check out this Pinterest search filled to the brim with about a zillion genius hacks on this bed. Of course I couldn’t just buy this bed, assemble it and call it a day like a normal person. That would be way too easy and economical. I had to customize. And, of course I couldn’t stop with just one bed. Kiki wanted in on the action, too. Who wouldn’t, really. 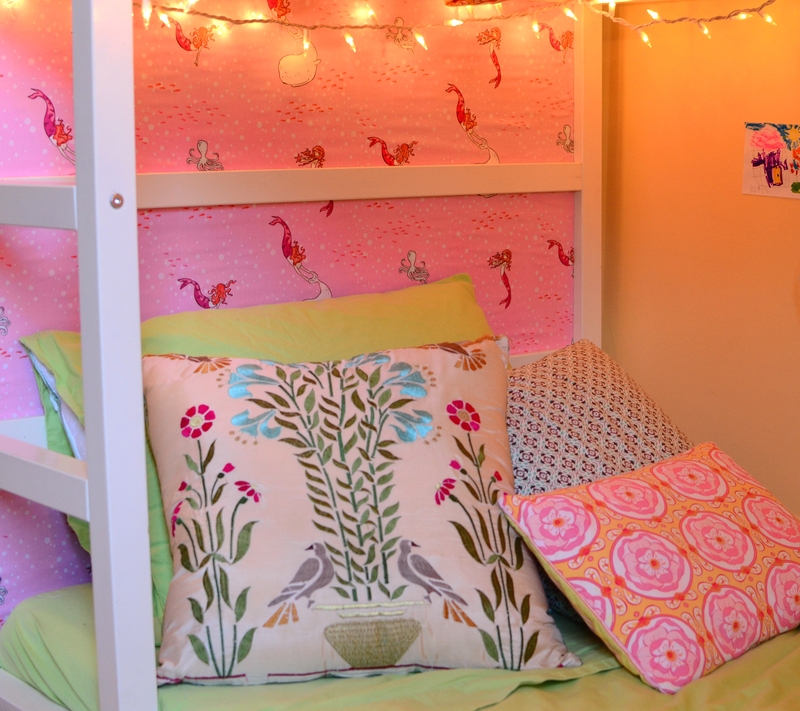 Customizing an awesome bed for her sister and not for her seemed cruel. So two beds it was. I decided right away that I wanted to paint the frames white, and that I wanted to cover the panels with fabric. I gave both girls a carefully curated selection of fabrics to choose from. Lulu chose Sarah Jane’s Wee Wander Summer Nights in twilight and On Parade, and Kiki chose Heather Ross’ Far Far Away Unicorns in green and Sarah Jane’s Out to Sea Mermaids in blossom. My husband watched the kids while I drove out to Ikea and bought the beds. When I got them home and opened the boxes, I was completely horrified by the number of frame pieces that required sanding, priming and painting for two beds (if I really wanted the beds to be white, which I did.) The girls would be in high school before I’d ever finish this painting. 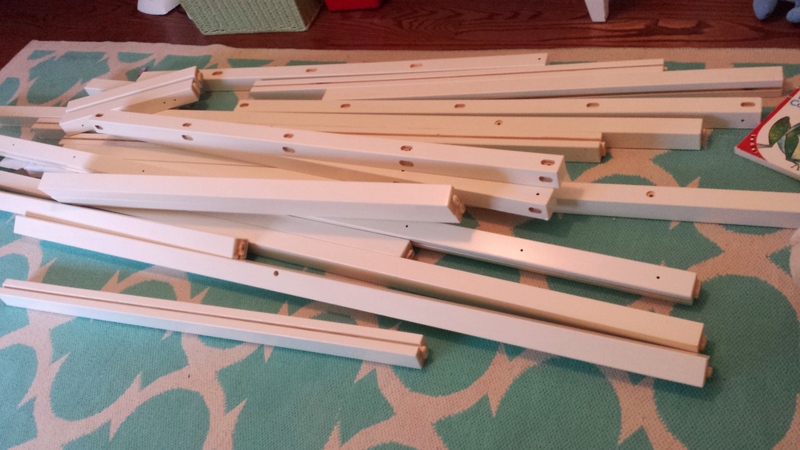 Emergency Distress Call to Handyman #1 — Dear Handyman, can you please, please, please sand, prime and paint all 100,000 pieces of bed frame and save me countless hours and frustration, as I’m not really that good at it myself??? Answer — yes. 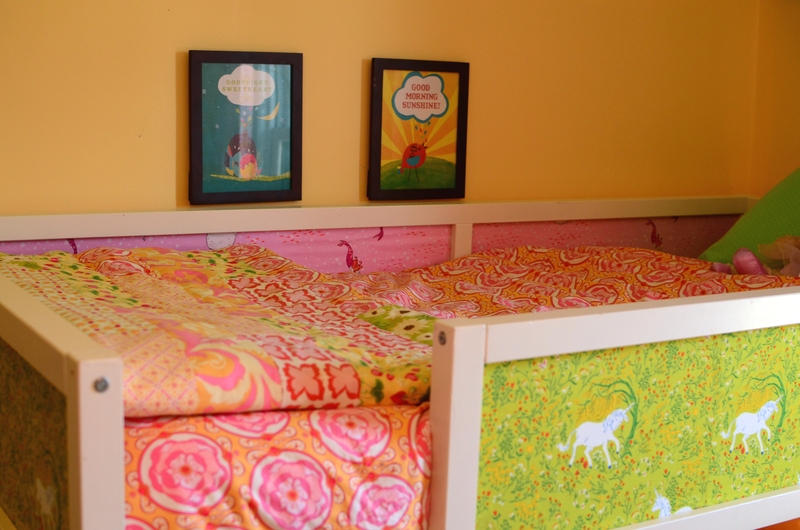 Ok, so a couple days later, I have a huge pile of freshly painted bed pieces up in Lulu’s bedroom. Time to finish up my cappuccino, roll up my sleeves and get crackin. The way this bed works is that it’s basically a wood frame with thin fiberboard panels that slide into groovess in the frame. 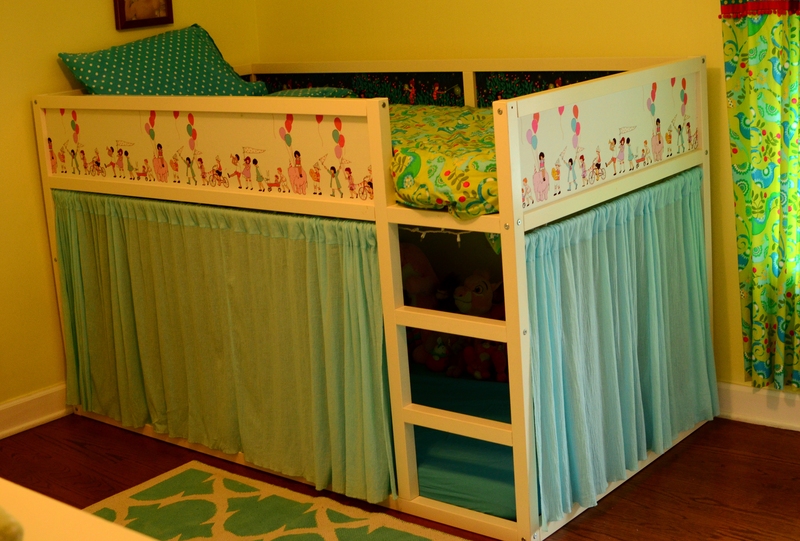 The first thing to do, then, is to cover your panels with fabric (or wallpaper or whatever). Survival Tip #1 — You’ll notice that some of the wood frame pieces are labeled with numbers. 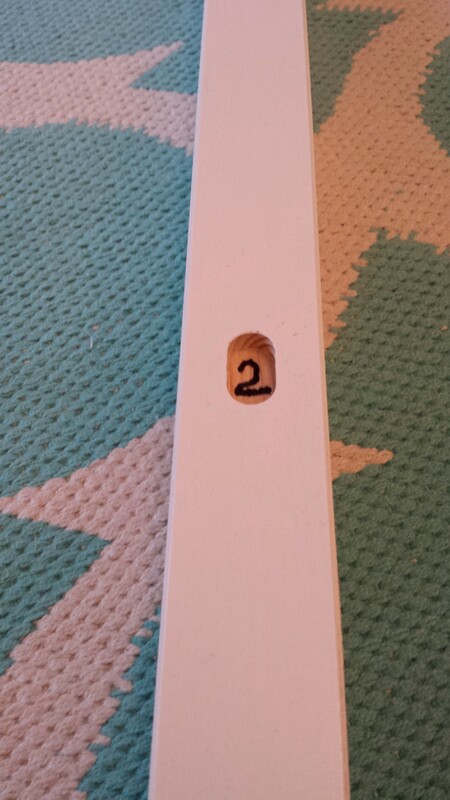 If you decide to paint your frame, be sure to write in your numbers in Sharpie. If you don’t, you might end up killing yourself when it’s time to put the thing together. 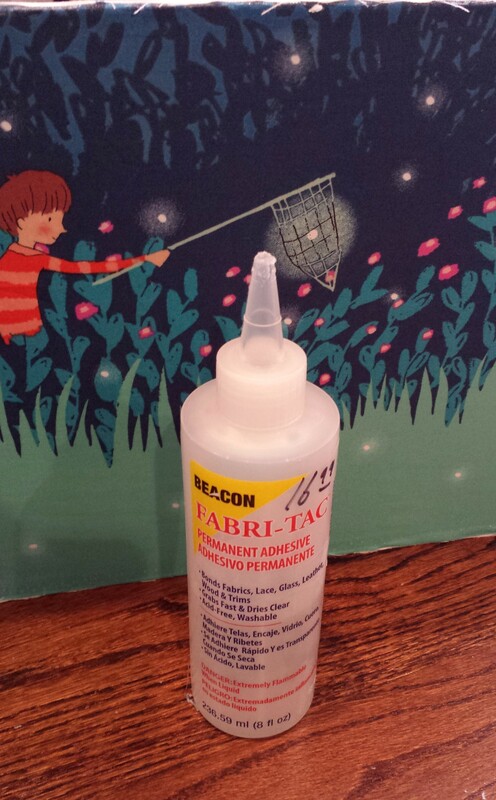 I got myself some good fabric glue. As you can see, it’s not cheap. But in this case, I think you’ve got to use the good stuff. Next, I cut my fabric about one inch wider than the first panel on all sides. Then, I squeezed on that glue. 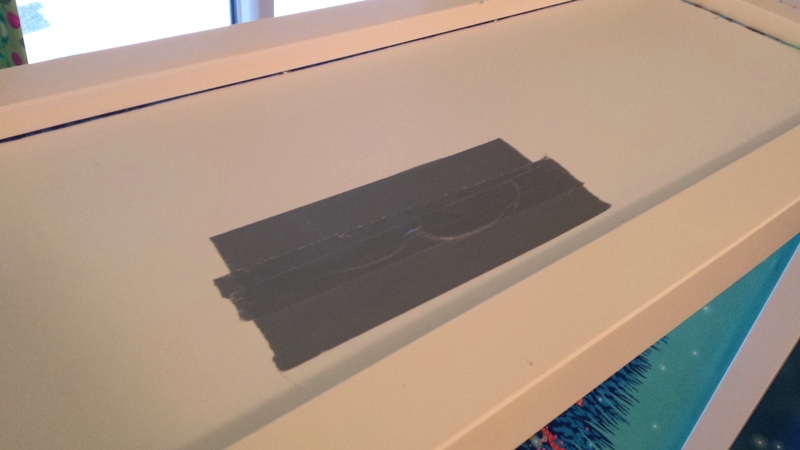 Then, I adhered my fabric onto the panel, making sure to smooth it out really thoroughly and tightly. It should look something like this . 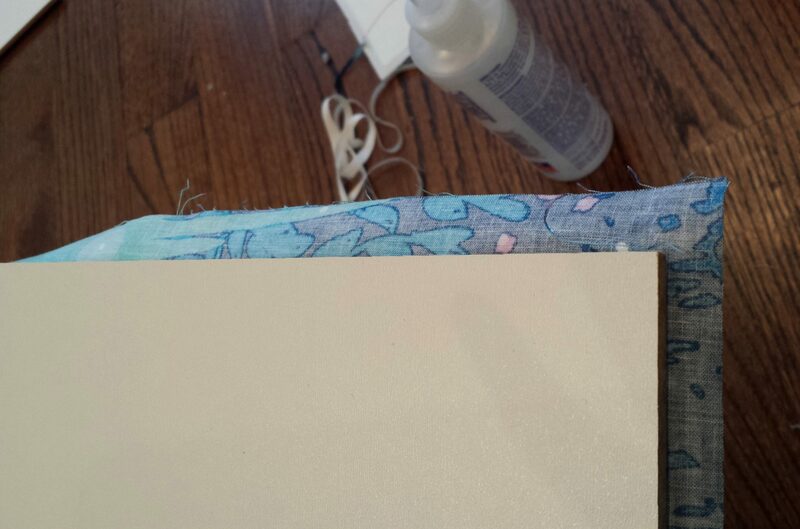 . .
Next, I trimmed the fabric so that I could glue the fabric to the edges of the panel without overhang. Then, I squeezed glue along the top, bottom and side edges of the panel and folded the fabric over, faking it on the corners. I think I ended up trimming the fabric on the corners to avoid excess bulk. Then, I repeated the same thing on the other side of the panel. I ended up with this. After covering all seven panels, it was time to assemble the thing. I’m sure you know what that’s like. Then, trouble arose. When I tried to slide the panels into the grooves on the frame, the gd things didn’t budge. The addition of the fabric and the glue made them too thick for the grooves. Double crap. I took a deep breath and ran like the wind to the hardware store, where a very well meaning clerk suggested I purchase a Drummel Tool, with which I could allegedly plane the grooves to be wide enough to accommodate the now thicker panels. Ok. This did not go well. If you’ve ever used a Drummel Tool (I had not, obviously), it’s like a crazy strong and (if you’re me) uncontrollable electric knife. As soon as I touched the blade to a frame piece, wood shaving flew every which way and I managed to gouge up the thing in a terrible way. I tried again. It was worse. I was afraid that three things would happen if I continued . 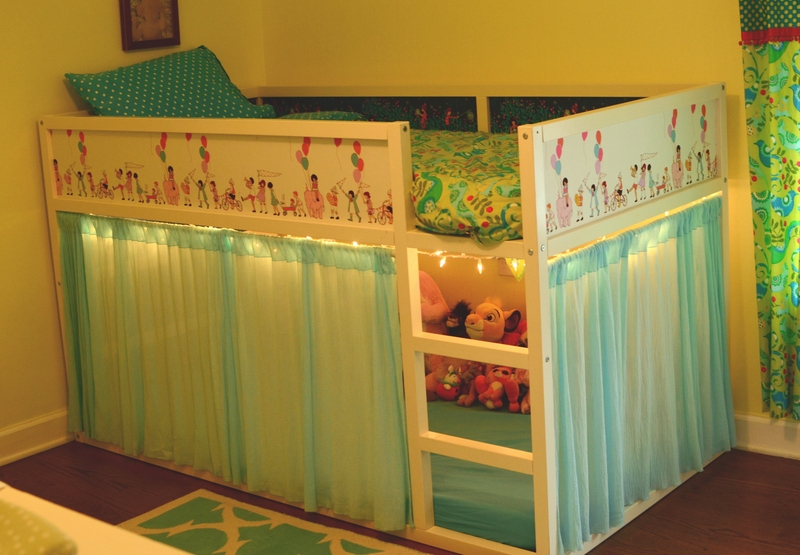 . . 1) I’d ruin the bed, 2) I’d gouge up the wood floor in Lulu’s room, and 3) I’d maim myself. Once I got the planed frame pieces back from the most excellent, talented and patient handyman, things went much more smoothly. After the bed was all assembled, I realized that two things were missing . . . lights and curtains, of course! 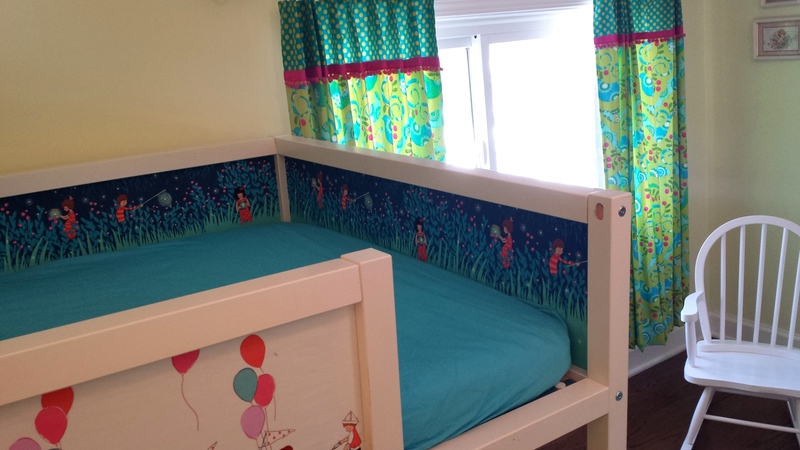 The curtains are just panels of $3/yard cotton gauze with a rod pocket sewn on top and zig-zagged edges attached with tension rods. 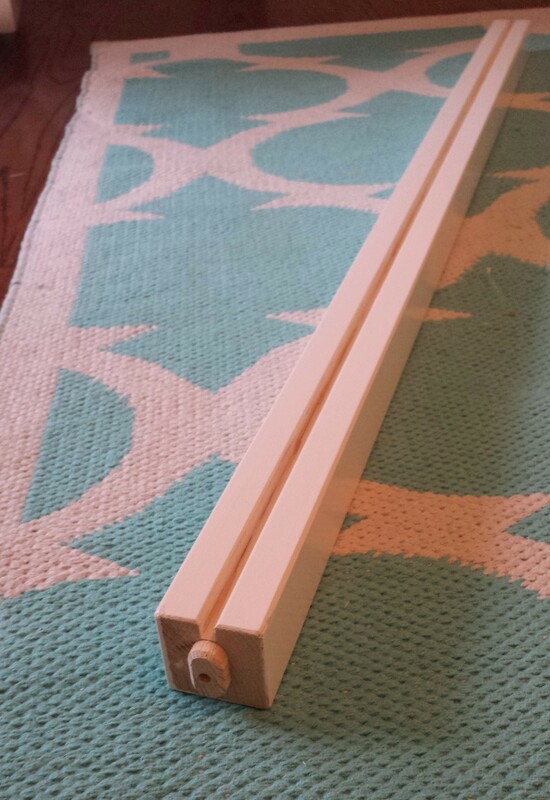 The rods do get pulled down periodically, but I haven’t come up with a better method. No big deal. 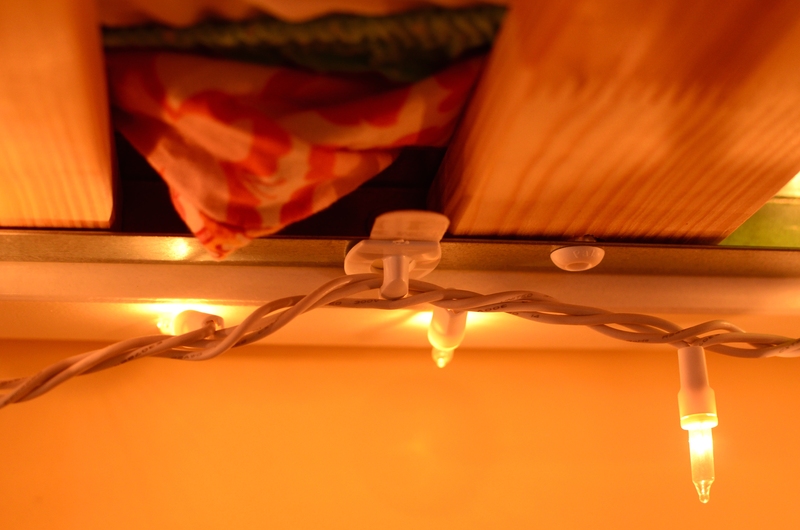 The lights are attached with 3M Command hooks. Aren’t those things just so handy? 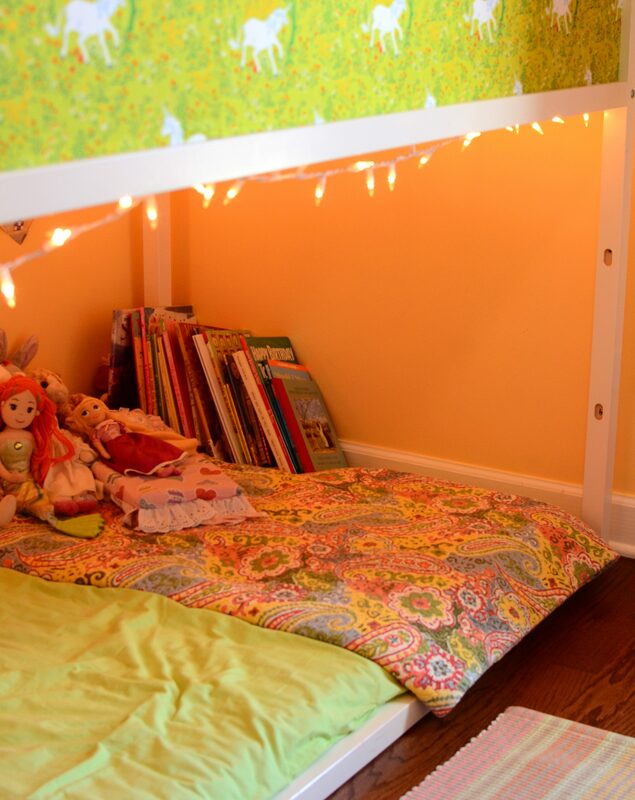 Here’s Lulu’s bed from underneath . 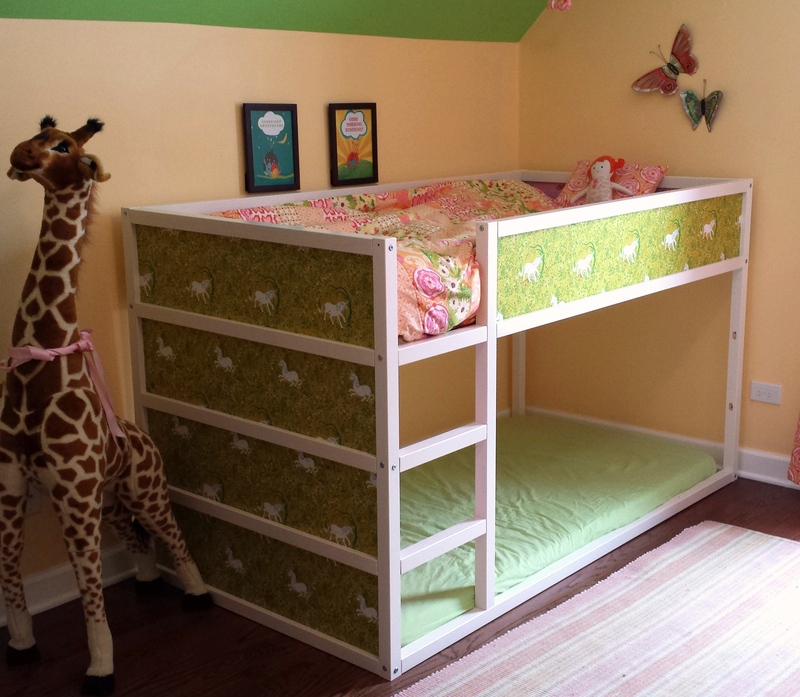 . .
Now that Lulu’s bed was all done, I got to do it all over again for Kiki — but this time without the steep learning curve. Kiki opted for lights, but no curtains. As my own mother often says “I wouldn’t do this for anyone else.” This is love, my friends! Stayed tuned for the next installment . 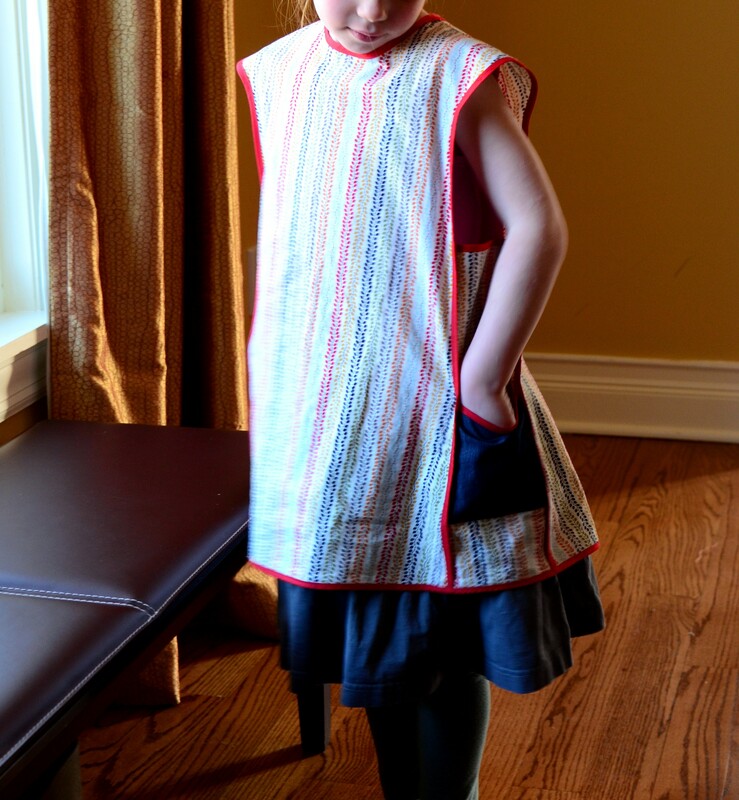 . .
Is it me, or is there something about kids in aprons that just feels right? I can’t explain it, but it’s true. 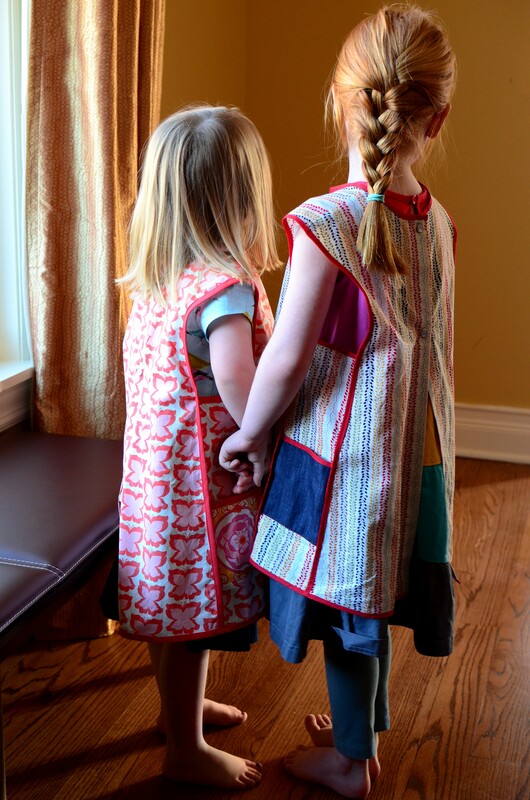 I’ve been wanting to make my girls Bias Trimmed Aprons from the Oliver + S book Little Things to Sew for ages. Kids Clothes Week, which wraps up today, was just the thing to make me deliver. 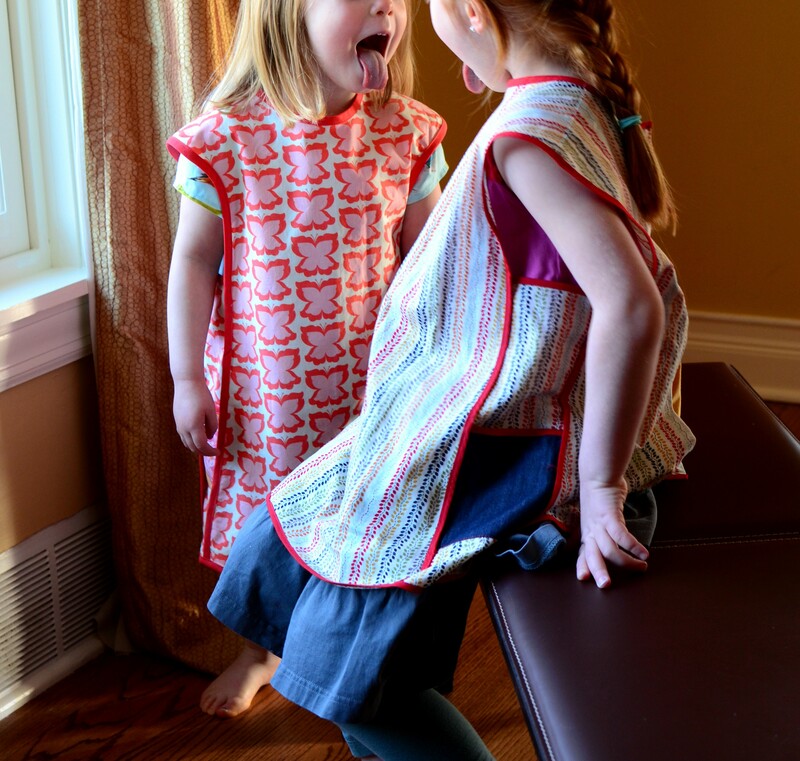 I knew that there was a high likelihood that the aprons would go into heavy rotation right away, as Kiki and Lulu both love to play “Villagers” all the time — which is a game that came from an idea planted by Sofia the First. (If you have a kid in your life who’s in the preschool/kindergarten set, you may know that Sofia starts out as a “girl in the village doin’ alright and became a princess overnight . . . now gotta figure out how to do it right . . . you know the rest. So it follows that we must play Villagers.) As everyone knows, Villagers wear aprons. Kiki and Lulu have been making do with the cooking sort that came with their play kitchen. But these aprons . . . these are authentic Villager all the way!!!! True to form, Lulu was mostly unimpressed. 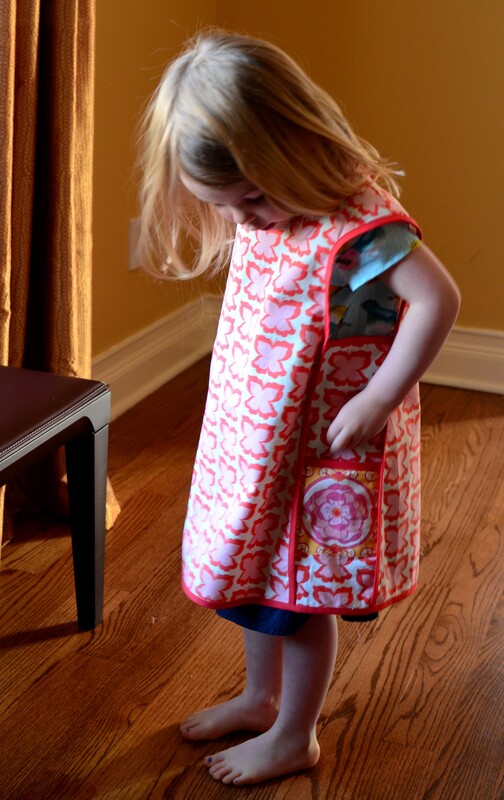 But Kiki — Kiki loves her apron more than words can say. So far, she’s worn it to school, swimming lessons, out to lunch and to a birthday party, all within the two days that she’s had it. 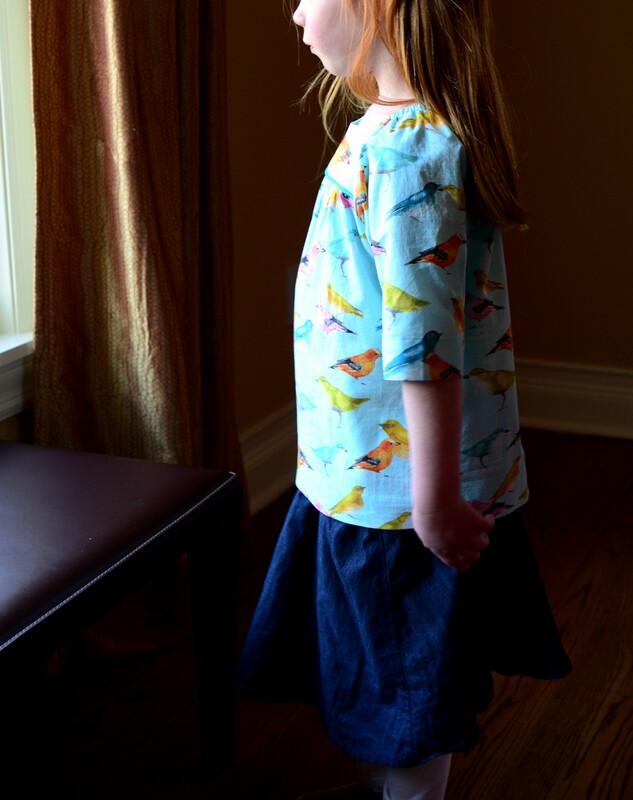 It’s enough to bring a tear to the eye of a sewing mama. I’ve been trying to be a good citizen and sew exclusively from my stash for a while. We recently put carpet in our basement, where my sewing set-up is, which precipitated a big reorganization of the fabric stash and a shocking realization of just how much I’ve accumulated over the past few years. Both of these aprons came from that stash. 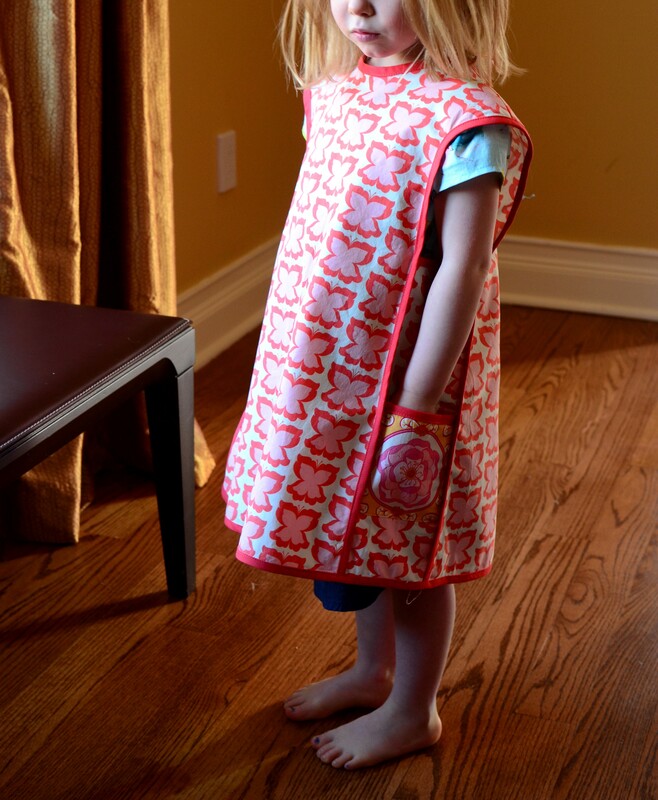 Lulu’s apron is made from fabric leftover from crib sheets, bedspreads, quilts and curtains for Kiki’s bedroom. I bought tons of extra just in case, and am now trying to find ways of using it. It’s from the Meadowsweet line by Sandi Henderson for Michael Miller. It’s from a bunch of years ago and might still be found on Etsy — but it’s mostly gone by now. 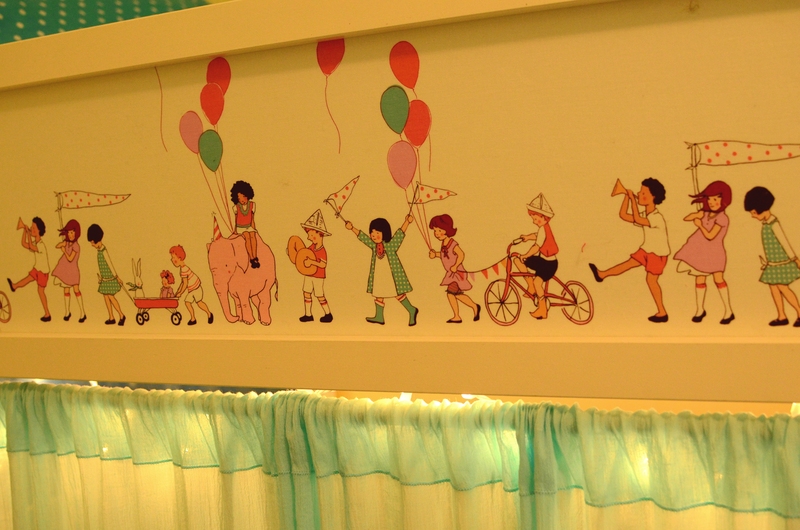 Despite seeing it everyday in Kiki’s room for the past five (almost six), I still just love it!!! Both girls got mediums — meant for ages 3-6. Somehow, it fits them both just fine! 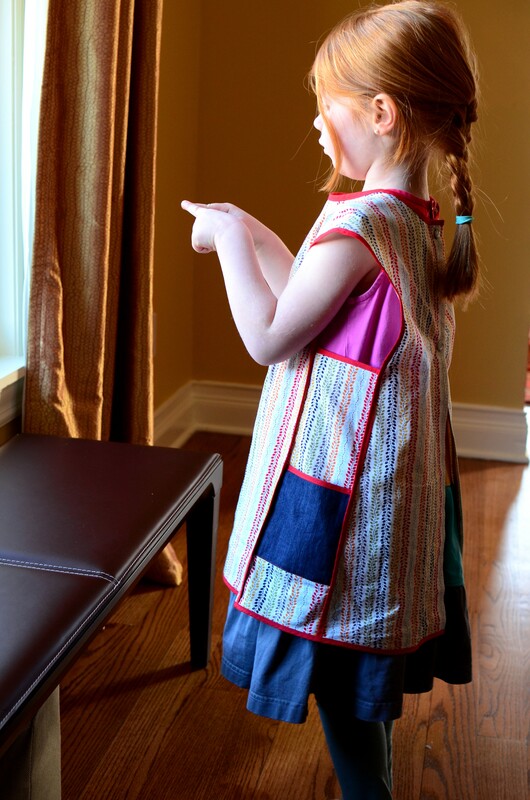 Kiki’s apron is made from fabric that I saw online somewhere as someone’s Geranium Dress a year or so ago. I hunted it down and bought a couple of yards and haven’t used it until now. The selvage tells me that it’s Tiny Leaf Garland from Adorn It. I think it’s just perfect for this project — and happily, I have plenty leftover for something else. 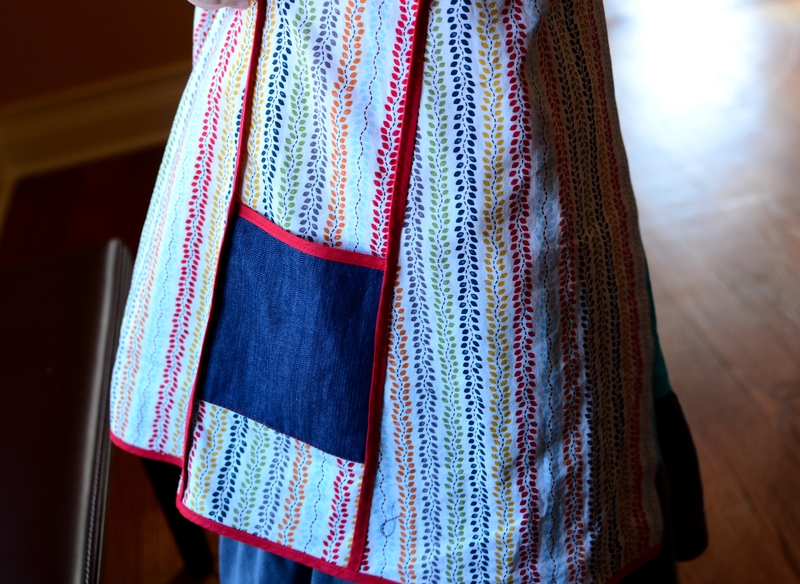 Since the print is non-directional, I was able to squeak this apron out of very little fabric. The pockets are Robert Kaufman Chambray. 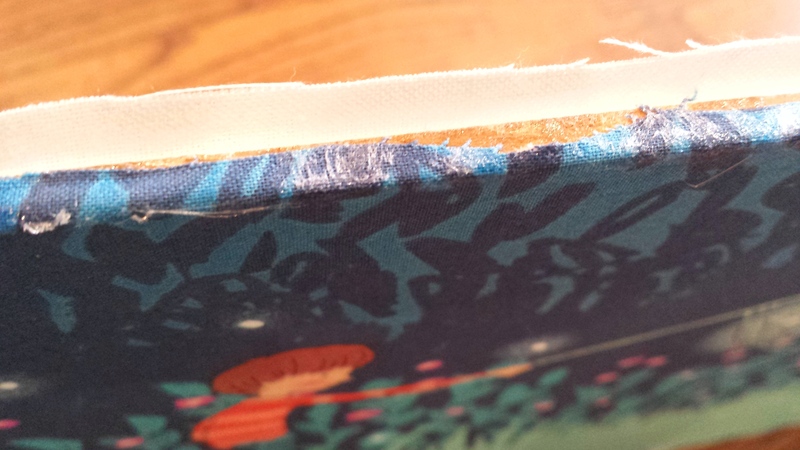 True confession — when it comes to double fold bias binding, I’ve recently gotten into the nasty habit of just sandwiching it over the raw edge and sewing it once, instead of unfolding the bias tape and sewing raw edges together on the wrong side, flipping it over, and topstitching. This is an evil shortcut. I tried it with apron #1, which happened to be Kiki’s. It didn’t end up looking as professional as I had hoped. The stitching is kind of uneven, and I had to go back and restitch places where the tape had slid off. Not cool. A light bulb went off in my thick skull and I wondered if applying the bias tape in the correct way would solve these issues. The plus side of sewing two versions of the same pattern is that you get a do over right away. So for Lulu’s apron, I went all out and sewed the bias tape with the proper two step method. Low and behold, it came out so much better. And wouldn’t you know, in the end it took less time. Lesson learned. 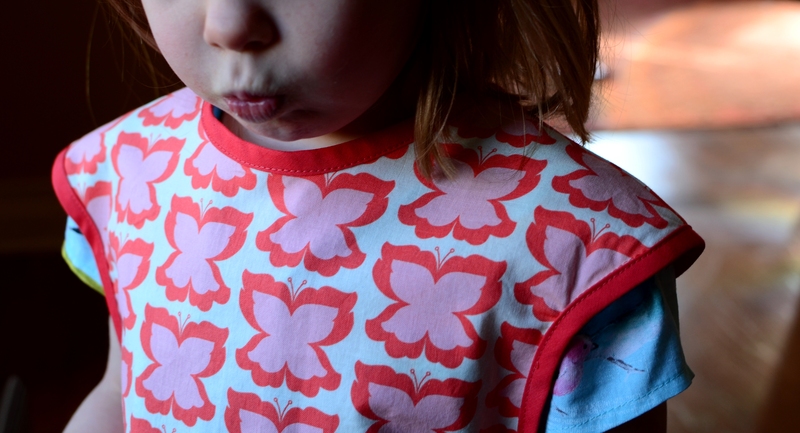 Just so you know, I used store bought red 1/4″ double fold bias tape for Kiki’s apron (which was fine), but made my own bias tape with my always awesome Clover bias tape maker for Lulu’s to match the orange butterflies exactly. If you don’t have one of these handy tools, get one! I also ended up getting a Dritz Easy Attacher Kit to help with applying the snaps, as I’ve had trouble with this in the past. 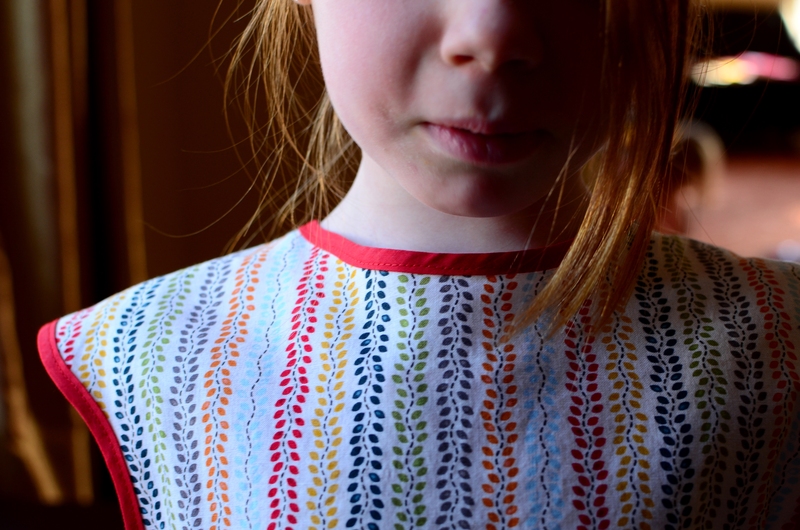 I was looking for the Snap Setter, which is recommended by Oliver + S, but only found the Dritz version at Joann’s and decided to take a chance (since it was Kids Clothes Week and I didn’t want to wait for shipping). It was definitely worth the $7 it cost and made hammering on those snaps a breeze. 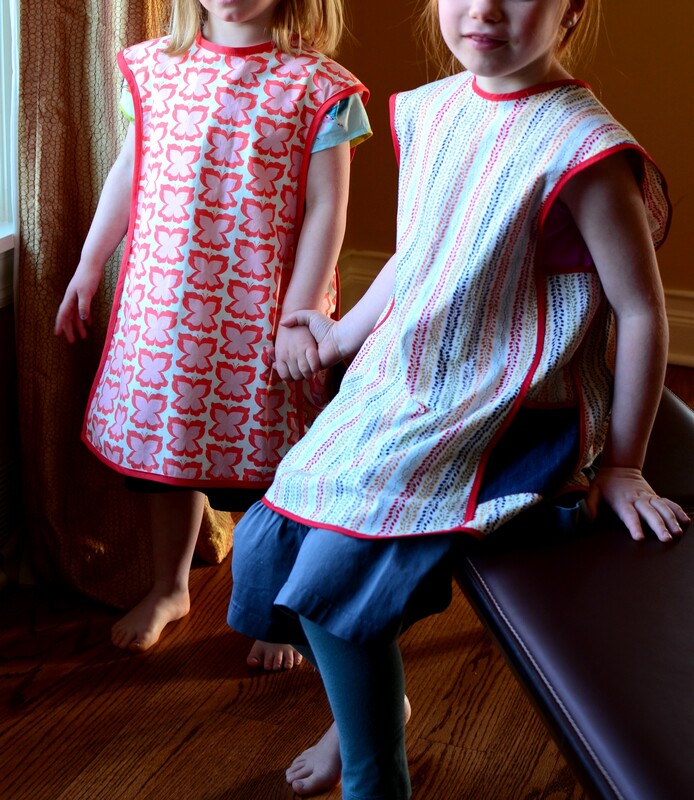 If your kid is up for a good game of Villager, you’d best get cracking on one of these aprons! Yes. The holidays are over, and it’s January already. What better time to show you the jackets I made for Kiki and Lulu for fall? Ha! Both of these little ladies needed something cozy for brisk, windy fall days. And since Kiki is off in kindergarten all day now and Lulu is hot on her trail, I wanted them both bundled up in something made with love from dear old Mom. I’m way into corduroy these days, and it seemed to be just the thing for the exterior of these babies. Both ladies chose their own colors, and both picked this fab orange. At least I’ve taught them something! 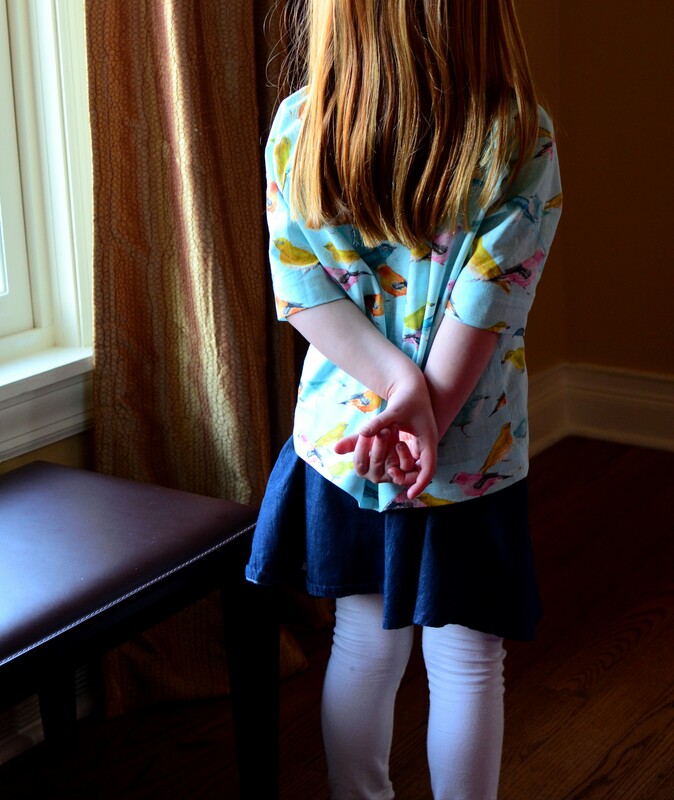 For the lining, Kiki chose this Allison Cole Happy Camper flannel, which I can’t find any more of by now (since I bought this fabric back in September!). It’s a cute print with little tents and teepees and campfires and woodsy critters — an interesting choice for a girl who lives in a decidedly non-camping family. Oh ye gods, I hope she’s not trying to tell us something!! For her cozy jacket’s innards, Lulu picked the always fabulous foxes from Made By Rae’s Fanfare Flannel in pink. I have to say that I was so pleased with this pick! Kiki got these wonderful green spangly buttons that coordinate with her lining. They add a nice sparkle on a blustery day without going the way of the princess. Yes, after a couple of washes the flannel pills a little. I have yet to find one that doesn’t. That’s life. It’s still the coziest stuff! The pattern for both jackets comes from 5&10 Designs, Volume 2. If you’re not familiar with 5&10 Designs, it’s a group of five bloggers who put out basic pattern blocks with instructions on how to hack them ten different ways. They’ve put out three volumes, and this jacket is taken from the second volume — as was the coat I made for Kiki last year. To put these jackets together, I started with the basic pattern block for Look One. I made it longer and drew the sides out a little to create a more A-line shape. I also made the facings for the button placket several inches wider. The pattern calls for placket facings that end up being only about an inch wide, which may work for snaps but doesn’t cut it for buttons like these. Here’s what Kiki’s last year coat ended up looking like with the narrow facings. Happily, I lived and learned. Just look at them now! I wanted to be sure that these jackets would be warm enough, so I went ahead and added fusible fleece on the inside (following a tip from Hungie Gungie). It’s so easy to do — just cut the same pieces from the fleece as you cut for the exterior pieces (not the facings) and fuse ’em on. You’ll get a jacket that’s much thicker and warmer, but not bulky enough to make sewing difficult. If you feel like you’ve seen the fabric on Lulu’s hat before, you’re not crazy. It’s Heather Ross Briar Rose jersey. I made these hats from an Ottobre pattern from the 4/2015 issue. You can also find this pattern along with a handy tutorial for free online. This little hat is a breeze to make, especially with that tutorial to explain it all. It could also be easily enlarged for adults. But to be honest, I’m not in love with how it looks on. The seam runs ear to ear, and the bulk of the seam allowances makes the shape look a little weird. I’ll have to try this again trimming the seam allowances more to see if that helps. I mean, it takes only about 20 minutes to whip one of these up, so it’s worth a little experimentation on some extra knit fabric. Now that the winter chill is here, these jackets have been put away. I’m hoping that they’ll be just a cozy on early spring mornings.